My awesome & courageous sister, Dana Allen, was diagnosed with Anaplastic Astrocytoma Brain Cancer in the summer of 2015. She's had 2 surgeries & we thought she was on the road to recovery. In January, her MRI revealed new growth, sadly. 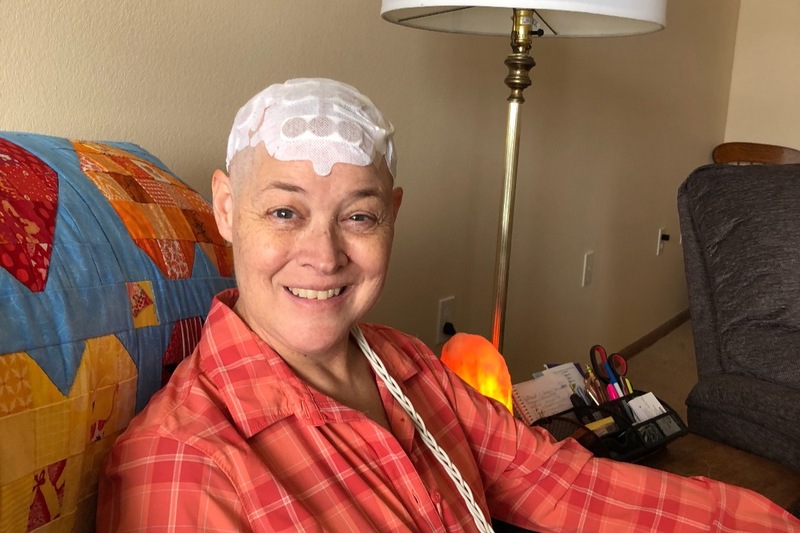 She has 3 new brain tumors on her left temporal lobe. Grade 3.5. Dana's heroic husband, Ken, had to quit his job in order to care for her, so money is Tight! She is on Medicare now, but because she is only 52, she must pay $800 per month for the health insurance, and her husband now is without insurance (he's working part time). They just moved into a low income apartment, which is also $800 per month. She has a large co-pay for her chemo meds, steroids, etc., but fortunately, her OPTUNE treatments ($20,00 per month!) are covered by Medicare. She has 2 granddaughters on the way, due this spring. Dana continues to have a sunny disposition throughout her struggles communicating. She is a true inspiration, and she just keeps on keeping on. "I'm going to live to 90" is her mantra. Please give what you can, and if you don't think $10 is enough, think again. It all adds up, and we appreciate any contribution. 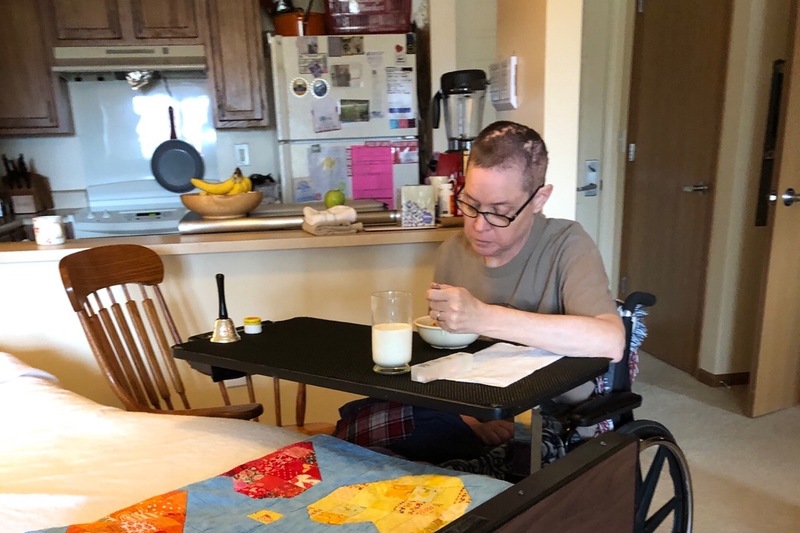 Here’s the latest: Dana had a strong seizure on Monday 4/15/19 resulting in no speech and difficulty swallowing. Tonight, 2 days later, she is making some strides and is able to say a few words, sometimes a sentence. She’s been able to feed herself & has an appetite today. Pretty amazing change, but she is a fighter! Dana is very frustrated that she can’t communicate or express what she wants/needs, and she’s very upset that this is happening to her body and mind. But look at her determination in the attached picture. Thanks for your kind thoughts, everyone! 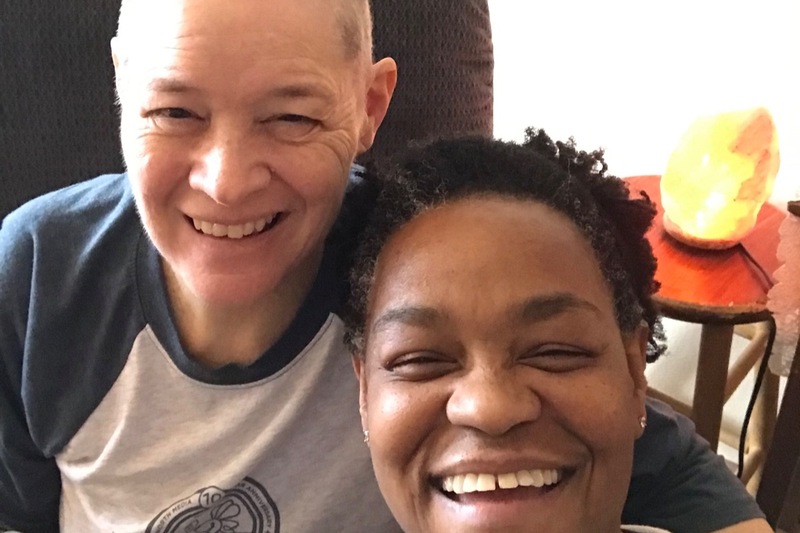 Thank you, everyone, who have donated to, asked about, prayed for, and thought of my sister, Dana. She continues to smile through her challenges, which is a great blessing to us all. Our Dad is currently visiting with her and said they had a really good day yesterday. Feel free to send her messages on facebook, and her husband Ken, or another friend or family will read them allowed to her. Ken Allen, Dana’s husband, has asked me to let you all know how grateful he is for all of the donations and emotional support for Dana & the Allen family. Lately, Dana has been experiencing more headaches, which we worry could be the tumor pushing near her right eye. She had a seizure yesterday, which was the 1st in several weeks, so today she is taking it easy while we watch the storm come in, watching the Michigan-Michigan State game. Well, Dana’s Doctors have determined that treatments are no longer working for her, so she is now accepting Hospice Care. She is still at home with Ken, and the Hospice workers come to her there at their apartment. She is unable to walk or stand on her own, using a wheelchair to get everywhere now. Dana has adapted pretty well to feeding herself using her Left hand. She continues to enjoy watching sports in tv, and she continues to keep up her sense of humor as best she can. I’ll be visiting her again the end of Feb.
Hospice does have it’s perks. Really wonderful people. She can have an occasional beer now. No more infusions or optune treatments zapping her head. Send Dana some good cheer. I’ll read the messages to her when I see her in person.